This Saturday, 15th October at St Peter's there is a concert of piano music, not to be missed! Nearly 3 years ago an amazing young pianist from Tisbury, Alexander Chapman Campbell, launched his debut album "Sketches of Light" in a concert at St Peter's, inspired by time spent in North of Scotland, Alexander has now moved there and released his 2nd album "Portraits of Earth" in March, which is now the basis of a UK tour. He is performing at Manchester Cathedral on 22nd October but the week before, on the 15th, he has asked to return to St Peter's for a concert " where it all began ". This is a unique opportunity to hear this extraordinary talent, whose music is hauntingly beautiful and has been described as "a glimpse of something new". 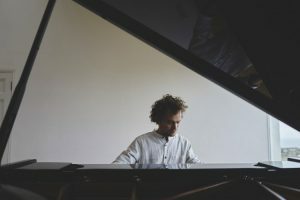 The concert will be at 7.30pm, Tickets £10 (£8 concession) can be obtained on his website www.alexanderchapmancampbell.com or at the door on the night.